There was an error downloading this photo from your iCloud Photo Library. Please try again later. See also: Your iCloud Storage Is Almost Full? When you enable iCloud Photo Library, every photos or videos you took will be upload to iCloud. You will be able to access your photos anytime from any of your devices, your iPhone, iPad, Mac. This will help you save space. Your device will store the smaller, low resolution, versions of the photos but the original, full resolution, versions will be stored in iCloud. You can access your photos via the Photos app or via the iCloud web site (icloud.com). You can see the smaller versions of your photos but you cannot download the full, original, versions? I had this issue yesterday. I was trying to attach a photo to a email message on my iPhone and I kept getting this message. And I could not attach it and thus I could not send the image. To fix for me was just to restart. I restarted my device and I was able to send the email with the photo attached. Please note that it takes some time for you see your photos on all your iOS devices. First tip you should try is to turn off “Low Power Mode”. When your iPhone or iPad is in Low Power Mode”, some iCloud features will be reduced. Go to Settings > Battery and toggle off “Low Power Mode”. Turn on and off Airplane Mode by going to Settings. We are doing this because there may be a connection issue and this action may resolve it. Ensure that you have enough iCloud storage. If you are over your limit, your photos will not be upload to iCloud. Sign out iCloud by going to Settings > Your Name >Scroll Down > Sign Out. You will be asked to enter your Apple ID and password. After this go to Settings > Your Device and Sign in. Do not worry you will not lost any data, your files including photos will be gradually restored again from your iCloud account. Make sure that you enabled the option to use cellular data for Photos. Go to Settings > Cellular. Force close all running apps by double pressing Home button and swipe up on all of the apps. Go to Settings > Your Name > iCloud > Photos > And select Download and Keep Originals. Make sure that your device has enough space. Thank you very much!!!! Figured out it was the size of all the photos I was trying to move across causing the issue! I had my low power mode on which wouldn’t allow me to download the photos. Make sure that is turned off if you get this message and see if it works. Why couldn’t I have seen this sooner? My phone lives in low power mode… I have deleted so much off of my phone over the past few days…. Thank you for posting this! You have saved me from losing my mind. you absolute genius!! WORKED INSTANTLY! Huhuhuhu. lost all my memorable photos. Glad I read the comments first. I backed my phone up, turned it off and on and still nothing. Found a YouTube video and all I did was go to settings>battery>turn of low power mode and it’s working now. THANK YOU!! This was the fix for me! Delete some of my photos but everything was backed up on my icloud. If your photos were on iCloud to begin with, resetting your phone or logging out of iCloud won’t delete them. When you restore iCloud to your phone, they are the last thing to show up and take some time to show up again. How long does it take for the photos to show up? MAKE SURE YOUR PHONE IS NOT IN LOW POWER MODE! You can tell if it is because your battery bar will be yellow. Turning low power-mode off worked for me. In regards to logging in and out of your iCloud, I always backup right before doing anything iCloud related. If you do log out and back in, your photos will probably take a very long time to load back. It deleted all my babies photos when she was born!! Thanks for nothing! I’m one pissed off mother!! 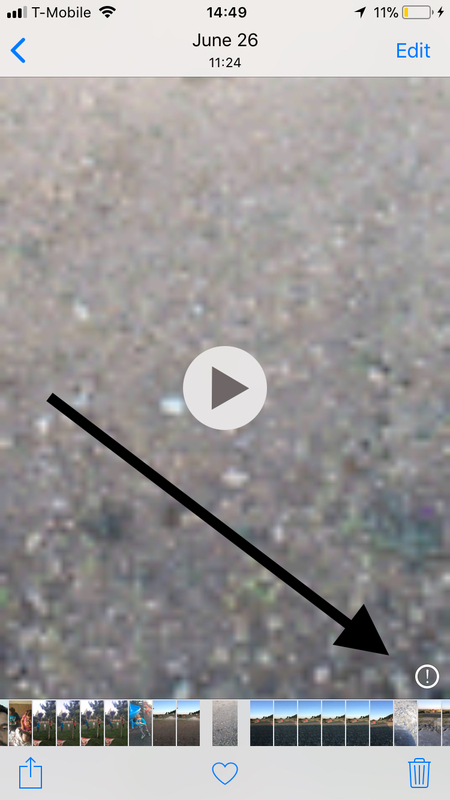 One easy fix that works for me is to open a video first. It takes a few seconds to laod. You can now close it and try opening photos. They should open now. This process, however, needs to be repeated everytime you get the error. This is a great help for me. Thank you very much. Kindly note that I have lost my videos & didn’t find them in I cloud ! @Rosalie – I just found my photos that had errors that were deleted from my phone when I did the steps above! https://www.icloud.com/#photos Good luck, Mama! How to restore them on Iphone? Turning off my low power mode helps! Thanks! 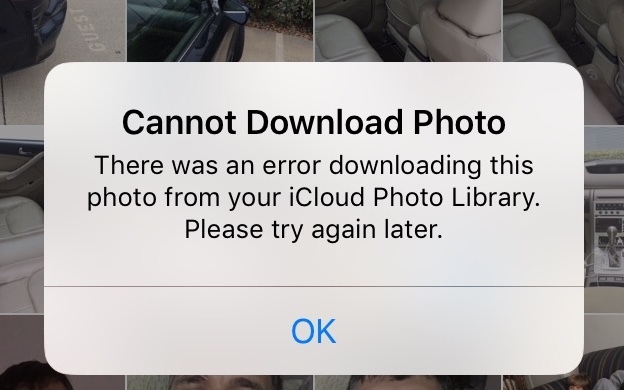 I have my iPad Pro 11 set to download and keep the original photos, and I still get this message even when the photo was created on that iPad (now iOS 12.2, but I think it was doing this on the prior version)! That shouldn’t be possible as there never should be a thumbnail only on a device both creating the photo and set to download originals. I also get the error message, “Cannot duplicate photo” under the same circumstances. I hope a reboot might fix these problems. To everyone claiming your photos were deleted when you “did this”, what did you do? The author recommended several options. And please follow up to the suggestions that the photo was still in your iCloud. Finally, macreports why is this comment field giving light gray text on a white background? Looking cool is great, but it is not functional. I can barely see what I’m typing. Is Jony Ive designing this site ;-? At least you won’t delete criticism like Apple is doing on their support forums with third-party repair firms claiming they can recovered some damaged iOS devices, I hope . . .